Pierre-Percée lake is classified public domain mountain lake second category. Fishing is therefore open to any fisherman holds a year fishing license current. To fish in more than one line, fishermen must be in possession of a fishing licence buyed in an AAPPMA Meurthe-et-Moselle or an "Interfédérale" fishing licence. 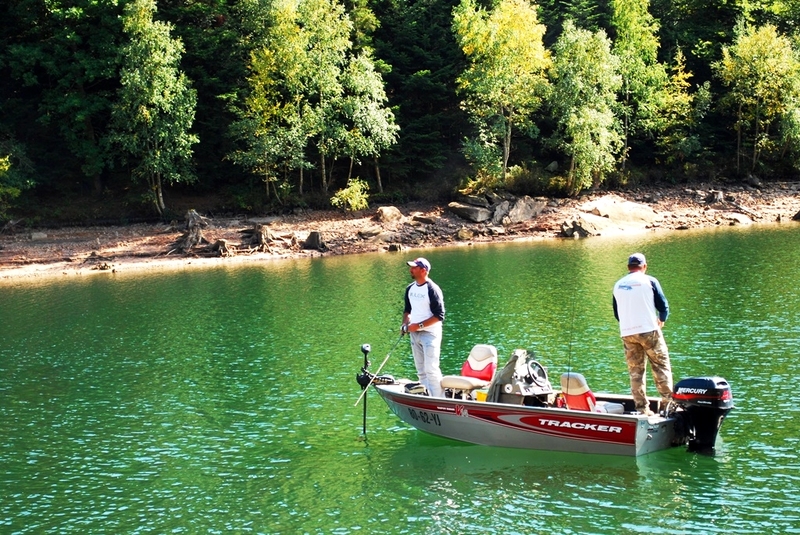 The fishing is allowed from January 1 to December 31, on the lake's edge, by boat and float tube. Fishing for salmon is permitted from the second Saturday in March to the 3rd Sunday in September included (whitefish fishery included). Fishing for pike and zander is authorized from 1 January to the last Sunday of January inclusive and from 1 May to 31 December. The number of allowed catches of salmonids (trout, whitefish) is limited to six per day per fisherman. The fishing with two hooks at the mounted rod is allowed. The trolling line is also authorized, each boat being provided with a maximum of three lines mounted cane. The use of the probe is authorized and leaded line with a mass of fifty grams maximum ten hooks provided at the storied above the lead is permitted exclusively for the fishing of whitefish. Are prohibited: Fishing nets and other gear. Fishing on the mentioned areas including all sections of banks and shores of these areas. Fishing near the structures operated by EDF in the areas between these works and the limits materialized and reported by EDF. Lower Nangoutte, Pre-Barbier, Les Bordes and Pierre-Percée Anse (Access to the lower parking lot only permitted for launching, parking obligatory on the upper parking). During the summer weekends of great affluence, it is advisable to use preferably made of water Pre-Barbier, Basse Nangoutte or Pierre Percee, Bordes boat ramp is very frequented by swimmers and others boaters. Fishing boat, for human or electric propulsion is allowed. Bailer and life jackets are mandatory in the boat are required to fish from a rowing boats. If the drive is by electric motor, a first aid kit and a fire extinguisher are also mandatory.